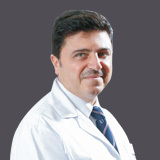 Dr. Juratli is a fellow to the Royal College of Surgeons of England; he carries the intercollegiate fellowship degree for the four Royal College of Surgeons of UK & Ireland. Dr. Juratli worked as a Consultant Otorhinolaryngologist, Head and Neck Surgeon at University Hospitals of Leicester, UK. Leicester Royal Infirmary “LRI” for 12 years from the 5th of January 2004 until the 1st of May 2016. He was one of the lecturers and examiners in the final OSCE exam at Leicester Medical School. Dr. Juratli also worked as an Associate professor and examiner at Damascus University and Al Moasat Hospital between 1995 and 2003. Dr. Juratli did more than 2000 Rhinoplasty during his practice, 482 of them at LRI hospital in UK, and successfully performed over 400 cases of FESS functional endoscopic sinus surgery. Dr Juratli has been experienced at Ventral Endonasal Endoscopic Skull Base Surgery and Lateral Skull Base Surgery since 1995. He currently uses the Navigation for opening the frontal sinus endoscopically “Modified Lathrop”, removal of Pituitary gland tumor and repairing CSF leak. He presented his 28 cases of endoscopic CSF repair at Franko-Arab Congress in Beirut from 12 to 14 Nov 1999. Dr. Juratli performed 287 Mastoidectomy and Ossiculoplasty, 250 Tympanoplasties, and 72 stapedotomy & Stapedaetomy cases. He is a top experienced doctor at Rhinology, Otology and Paediatric Otorhinolaryngology. He also performed 46 Parotidectomies, more than13 submandibular gland resections, removal of 5 branchial and 10 thyroglossal cysts (using Sistrunck technique). He currently operate on all benign vocal cord lesions microlaryngoscopically with the help of a laser and a microdebrider in accordance with the nature of the lesion. He operated on more than 90 patients with different stages of H&N cancer; for each one, and performed either comprehensive or non- comprehensive neck dissection surgery. 56 patients underwent total & partial laryngectomies .Dr Juratli is experienced in taking the Pectorals Major myocutanous flap. He operated on an infant with a congenital cystic hygroma and severe upper airway embarrassment. Dr. Juratli did more than 2000 cases of Adenotonsillectomy, around 60 Mastoidectomy and ossiculoplasy, and paediatric airway management. He is a speaker in three major country conferences about paediatric Acute Otitis Media and Allergic Rhinitis in Children. Please refer to www.dr-juratli.com CV. Dr. Juratli held an LRI post in the UK where he taught medical students the introductory course once a week for the first three years. He is currently an examiner of middle and final year medical students, and teacher to Semester 4 SSC in the medical school at Leicester University. He was awarded for contributing to the Final Professional Examination OSCE until 17 March 2016 just before starting his consultant post at Al Zahra hospital in Sharjah. He trained a number of SpRs and two Staff Grade colleagues, who are now consultants or on their way to applying for consultant posts. Dr. Juratli was involved in teaching under- and postgraduate trainees clinical and surgical skills at Damascus University. He was a lecturer and Associate Professor at medical school and the Al Moassat University Hospital, and was involved in regular on-the-job training in surgical and clinical skills of postgraduates during his outpatient and theatre sessions. He was a member of the faculty of Damascus Medical School and an examiner of undergraduate students in year four and in their final ENT viva exams. He was an examiner and research body sponsor of the ENT Postgraduate Master Degree thesis and final award. Dr. Juratli speaks English and Arabic. Ventral Endonasal Endoscopic Skull Base Surgery and Lateral Skull Base Surgery. Rhinology, Otology and Paediatric Otorhinolaryngology. Parotidectomies, submandibular gland resections, removal of branchial and thyroglossal cysts (using Sistrunck technique). Benign vocal cord lesions microlaryngoscopically, comprehensive and non- comprehensive neck dissection surgery. Adenotonsillectomy, Mastoidectomy and ossiculoplasy, and paediatric airway management. Fellow to the Royal College of Surgeons of England. Fellowship degree for the four Royal College of Surgeons of UK & Ireland. Member of the faculty of Damascus Medical School.